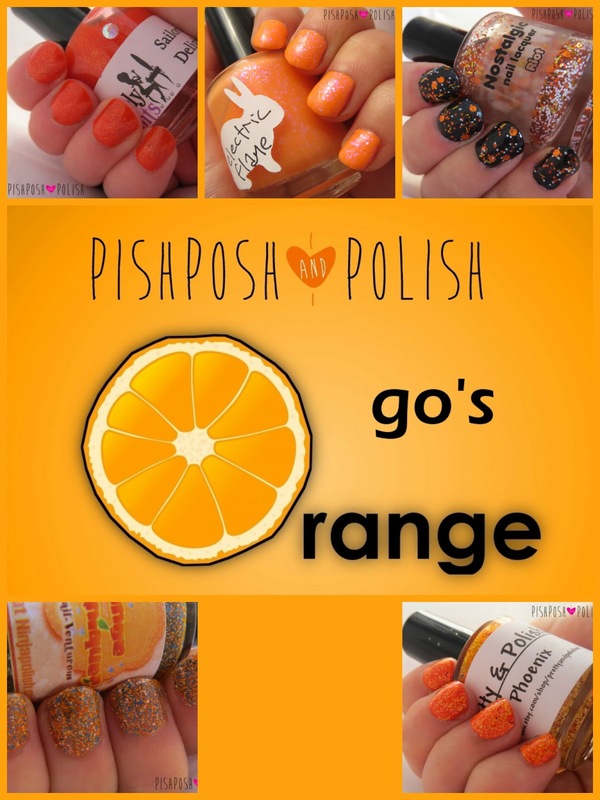 I hope you all enjoyed Orange Week over here on the blog as much as I enjoyed doing it. There is just something about orange that is super fun and happy- and i'm not even a big wearer of the colour! Here is a pretty collage with all my manicures! Looking back on the week it is hard to pick a favorite, I really like Hare's Electric Flame even though out of the five it was the hardest application wise. Both Phoenix and Orange You Unique contained matte glitter yet they couldn't be more different, I think Phoenix needs a different colour base to bring out all it's complexity! Riot reminded me how a simple glitter topper manicure when used on the right base can be really effective. This method is something I used to adopt alot in the early days of blogging before I felt as confident doing nail art and it is something I need to keep doing. The Girly Bits was the polish leaning the most towards the red end of the spectrum and this seems to be the readers favorite from the comments I received! Which one did you like best? Do you like themed weeks like this? Would you read one again? What themes do you want to see?? I just found you on bloglovin' last night but I think themed weeks are a really cool idea. I recently purchased Electric Flame. I had major issues with my polish peeling off by day two. :( Like I could peel off half the polish in one piece. I didn't do a base coat. I did notice right away how thick it was, yet it seemed so sheer. I did 3 (maybe 4) coats because the color seemed so washed out. Then I finished with two layers of top coat. I was really disappointed with this polish. So pretty, but hopefully I have better luck in the future. I should probably thin it a bit and then for sure use a light base. If I thin it should I thin the whole bottle or thin it separately? Not sure if I will wear it again until summer. It's such a fun summer color. Crossing my fingers for the next time.